This lovely soup was born of my desire for something quick and comforting when I was recovering from a nasty virus I picked up the last time I was in Austin. The last thing I felt like doing was cooking, let alone making a trip to the grocery store, so my only option was to forage through my freezer and pantry. It is a good thing I keep my freezer so well stocked, even though I often complain about how full it is. I was pleased to discover a quart of chicken stock in there, and some noodles on my pantry shelf. A quick chicken noodle soup was just the ticket. But of course I had to get creative with it, even as awful as I was feeling. 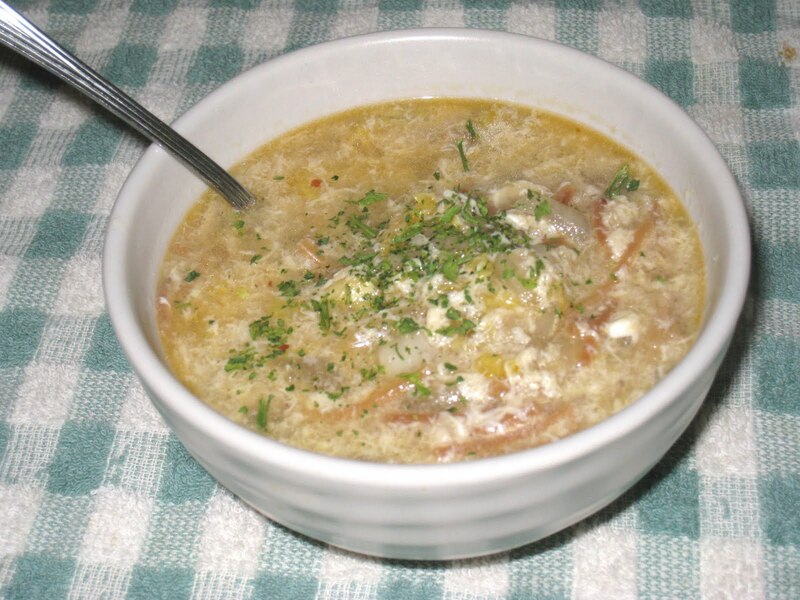 I did not have any chicken and I wanted to use some kind of protein, so I decided to make an egg-drop soup, which inspired me to give the soup an Asian twist. I quickly revised my plan and added ginger, napa cabbage, fish sauce and garlic chili paste to the broth. In record time I had a delicious, soothing, nourishing dinner. The Marsala added a sweet counterpoint to the sourness of the fish sauce and the heat of the chili paste. The pungent garlic chili paste cleared out my sinuses for the rest of the evening, so I was able to get my first good night's sleep since getting sick. Until now, I had never made egg-drop soup. Several online sources that I looked at before adding them said that the strands would be more silky if cornstarch was added to the liquid, but I did not feel like messing with it so I just dropped them into the liquid as it was. As you can see in the photo, the eggs did not make those lovely strands you find in the egg-drop soup they serve in Chinese restaurants. I might try it with the cornstarch next time, but I can say with no hesitation at all that there was no loss of flavor doing it this way. The beauty of this soup is that all you really need is the chicken stock, the noodles and the eggs. You can add whatever vegetables you happen to have. Instead of ginger, fish sauce and garlic chili paste, you can add thyme or poultry seasoning. The options are virtually endless. The beauty of this soup is the quickness and ease with which you can make such a hearty meal - perfect for those evenings when you get home late from a mind-numbing round of Christmas shopping and want to indulge yourself without having to work for it. It will rejuvenate you enough to go back out and do it all over again the next day. And if you want to make it vegetarian, just use vegetable broth and leave out the fish sauce - nothing could be simpler. Heat oil over medium-low heat in soup pan. Add garlic and ginger and cook, stirring frequently, for 2 minutes. Add onions and cook until translucent. Add cabbage and salt and cook for about 10 more minutes. Add the stock, chili paste, and fish sauce and bring to a boil. While the stock is coming to a boil, heat the remaining teaspoon of oil in a small skillet. Add the pasta and cook, stirring constantly, until the pasta is toasty brown. Remove from the heat. When the stock is boiling, add the noodles. Cook them for 2 minutes less than the package directions. Stir in the sherry. Turn off the heat and slowly add the beaten egg in a thin stream, stirring constantly. Garnish with green onion and parsley and serve immediately.